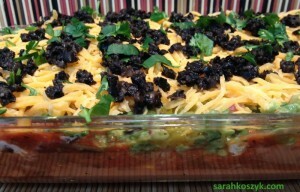 7 Layer Bean Dip with Homemade Guacamole & Homemade Tortilla Chips is super low in fat, a good source of protein, and easy to make! You can also just make the guacamole and eat it as its own dip. 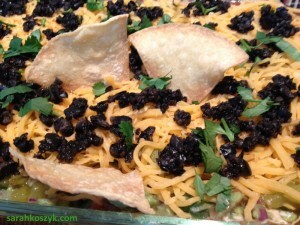 I baked homemade Tortilla Chips, too, and it’s very simple and quick! First make the guacamole. 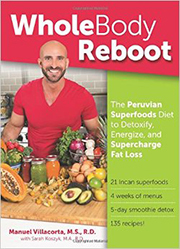 Remove the avocado from the skin and pit and put it in a large bowl. Dice the red onion and jalapeno into tiny pieces. Mince the garlic. 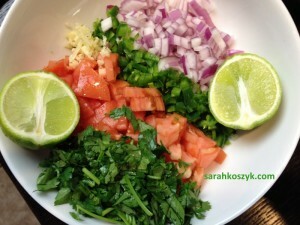 Chop the tomato and cilantro. 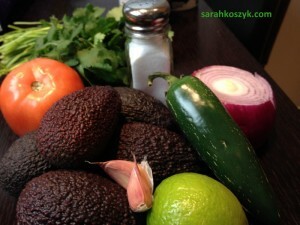 Add the red onion, garlic, jalapeno, tomato, cilantro, and salt to the avocado. Cut the lime in half and squeeze the juice into the bowl. Mash all the ingredients together and you’ve made guacamole! In a 13 x 8 glass Pyrex, spread the refried beans first. Next layer on the salsa, sour cream, and green chilies. These will all mix together. Spread on the guacamole. 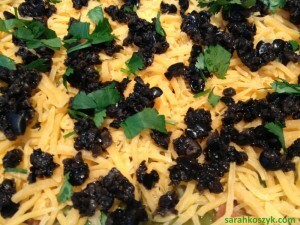 Sprinkle on the cheese and black olives and you’ve quickly made your 7-layer bean dip! Use these homemade tortilla chips to dip into the love!